Home NewsOur newly redesigned website! The website elves have done it again! 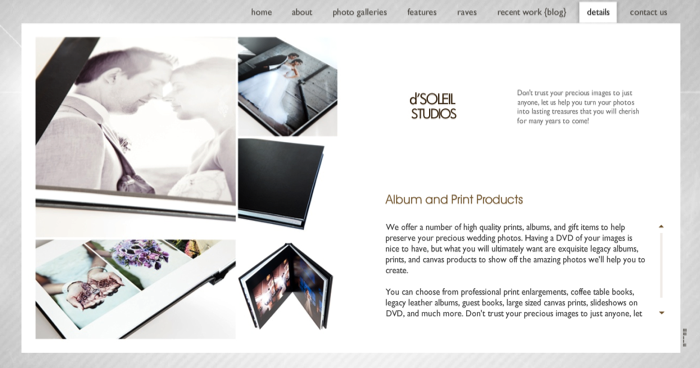 I’m proud to announce the launch of our newly redesigned main website filled with more information and many awesome photos created by d’Soleil from past weddings and engagement sessions! We’ve added a couple of new information sections and improved navigation around the website. I’m particularly thrilled about this design because we were able to launch it in record time – Just in time for the holiday season and the upcoming 2010 wedding year, which is looking brisk and super exciting! I can’t wait to start capturing photos from a number of fantastic weddings and engagement sessions already booked for 2010! love love love the new site! !